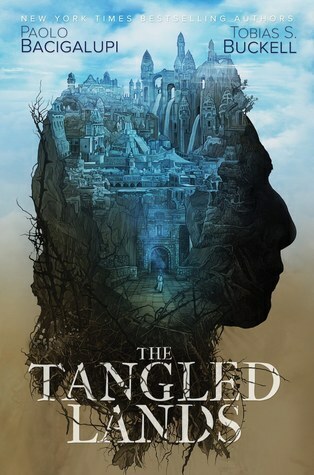 The Tangled Lands is an epic fantasy told as 4 related short stories. I did not know that when I started listening to the audiobook and thought I must have missed part of the story which happens sometimes with audiobooks. But looking further at the comments on Goodreads I realized that I didn't miss anything. I loved Bacigalupi's The Water Knife when my book club read it and even though epic fantasy isn't a top genre for me I wanted to give this book a chance. The land is being choked with bramble. I imagine it be some kind of tangly briar that grows from the expended energy of magic or maybe it is a byproduct of magic. Not only is it choking the land, if a person has even the tiniest of holes in which their skin is exposed, the lightest touch of the bramble will exact a punishment worse than death. For the person still lives yet all manner of life ceases. In one of the stories, these 'sleeping' people are sold to the highest bidder to do what they want with them. There are like brothels full of people who have been poisoned by the bramble. As I said there are 4 short stories contained within this volume. They all take place in and around Khaim, but each focuses on a different set of characters. However, several themes carry throughout the stories. On such over-arching theme is what will one risk to care for one's family. The people in this city aren't just suffering because of the amount of magic that was performed. There are also corrupt leaders who are oppressing the people. In the last story, a blacksmith's family is starving to death even though they have been commissioned to create a suit of armor for one of the lords of the land. In the time of magic, the family would have been rich and their skills were renowned. They still have the skill to create world-class armor, it is the labor and supplies that are proving difficult. In addition, the lord is not willing to pay what the suit is worth. Even though he is asking for the suit to be made in a way that his own use of magic will go undetected. The Tangled Lands is what I consider a 'deep-thinking' book. There is so much below the surface of the story that it will have you thinking about the themes in a much deeper manner. Epic fantasy fans will enjoy the worldbuilding of the opening story. While I sometimes struggle with epic fantasy, I felt myself drawn to the dystopian elements and enjoying the tales. And any fan of great storytelling will enjoy this book. Buy The Tangled Lands at Amazon or get it free as part of your free Audible trial.